A 22" x 35" deigned by Milton Glaser. It is soliciting student film makers to Create a Film Revolution. By participating in the 4th National Student Film Festival. Sponsored by the United States National Student Association through a grant from the Motion Picture Association of America. 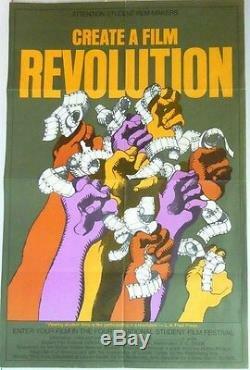 Depicts the 1960s raised fists of many colors grasping film ala "Power to the People". Free Press at base reads "Viewing student films is like participating in a revolution". Condition: had been stored folded. Light wear at fold right center margin edge and 1/4 bottom center margin edge. The item "4th National Student Film Festival Poster Create a Revolution 1969 Milton Glaser" is in sale since Sunday, January 20, 2013. This item is in the category "Art\Art Posters". The seller is "eclectible" and is located in Tolland, Connecticut. This item can be shipped worldwide.